Whether an individual doctoral study or a large-scale multidisciplinary project, researchers working across cultures face particular challenges around power, identity, and voice, as they encounter ethical dilemmas which extend beyond the micro-level of the researcher-researched relationship. In using a cross-cultural perspective on how to conceptualise research problems, collect data, and disseminate findings in an ethical manner, they also engage with the geopolitics of academic writing, language inequalities, and knowledge construction within a globalised economy. It is increasingly recognised that existing ethical codes and paradigms either do not sufficiently address such issues or tend to be rather restrictive and insensitive to multiple and complex cultural and contextual differences. This book extends our understanding of the ethical issues and dilemmas faced by researchers in comparative and international education. It asks what the relevance of postcolonial theory is for understanding research ethics in comparative and international education; whether Western ethical practices in qualitative social research are incompatible with cultures outside the West; how a ‘situated’ approach can be developed for exploring research ethics across cultures and institutions; and how ‘informed consent’ can be negotiated when the process appears to contradict community values and practices. 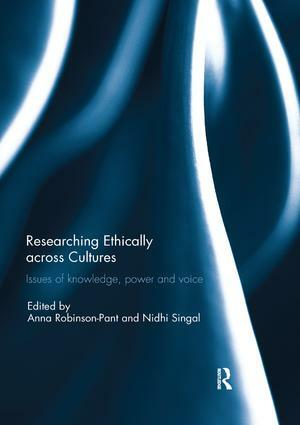 In sharing experiences from a wide range of cultural and institutional contexts, the authors offer both theoretical resources and practical guidance for conducting research ethically across cultures. This book was originally published as a special issue of Compare: A Journal of Comparative and International Education. Anna Robinson-Pant is Professor of Education at the University of East Anglia, Norwich, UK. She previously worked in Nepal as a development worker, teacher educator and researcher, receiving the UNESCO International Award for Literacy Research for her ethnographic study on women’s literacy and development in Nepal. In UK higher education, she has conducted research with international students, and is particularly interested in internationalisation policy and practice. Nidhi Singal is Senior Lecturer in the Faculty of Education at the University of Cambridge, UK. Her work focuses on the educational exclusion and inclusion of children with disabilities in low and middle income countries. She has been involved in various research projects in South Asia and Africa. She is particularly interested in ethical issues arising from researching with marginalised groups, particularly those with disabilities and in the ethics of research dissemination.